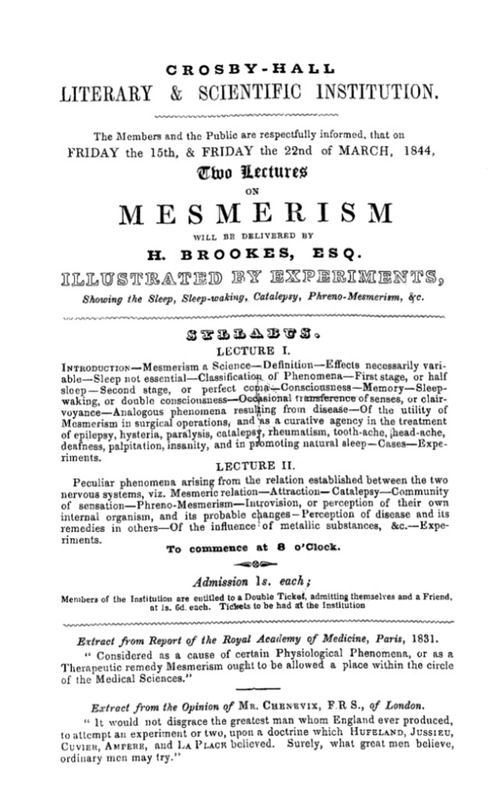 H. Brookes による "Two Lectures on MESMERISM" が行なわれると書かれていますが、続けて、"IIILUSRATED BY EXPERIMENTS, / Showing the Sleep, Sleep-waking, Catalepsy, Phreno-Mesmerism, &c." つまり、「睡眠や睡眠覚醒やカタレプシーやフレノ・メスメリズムなどを示す実験によって例証する」と説明があります。カタレプシー (catalepsy 英語の読みは「キャ」ですけど)は強硬症と訳されたりしますが、見た目が死んだように硬直してしまう症状で、ポーとかの「早すぎた埋葬　premature burial」というモティーフの「合理的」なタネのひとつです。フレノ・メスメリズムのフレノはフレノロジーのphreno で、メスメリズムと骨相学は1840年代には合体して、一緒に論及ないし展開されることが多くなっています（これはアメリカでもそうです）。まんなかには「シラバス」が載っていて、英語を書き写すだけしておきますと、"LECTURE 1. 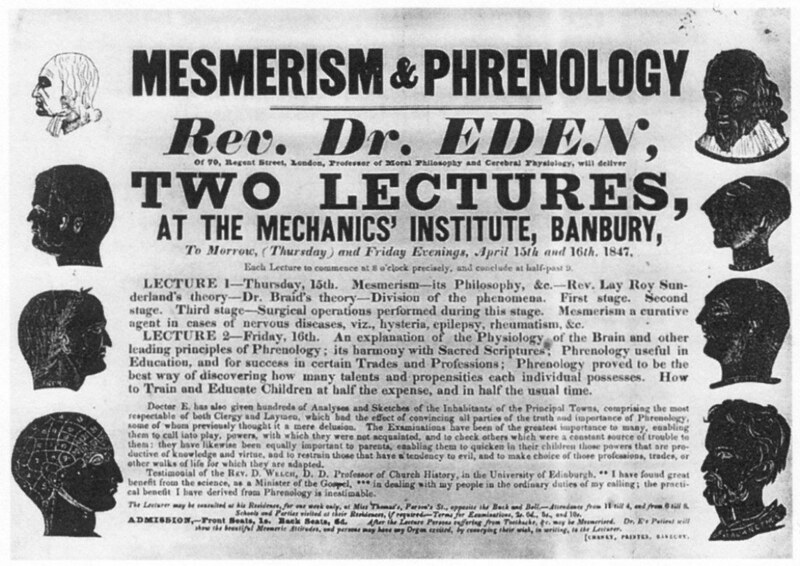 INTRODUCTION―Mesmerism as a Science―Definition―Effects necessarily variable―Sleep not essential―Classification of Phenomena―First stage, or half sleep―Second stage, or perfect coma―Consciousness―Memory―Sleep-waking, or double consciousness 〔二重意識〕―Occasional transference of senses 〔「感覚の転位」という訳語で正しいかわかりませんが、通常の知覚部位が体の別の部位に移動することだと思います。「手」でモノを「見る」とか〕, or clairvoyance 〔透視〕―Analogous phenomena resulting from disease―Of the utility of Mesmerism in surgical operations, and as a curative agency in the treatment of epilepsy, hysteria, paralysis, calatapsy, rheumatism, tooth-ache, head-ache, deafness, palpitation, insanity, and in promoting natural sleep―Cases―Experiments./ LECTURE II. Peculiar phenomena arising from the relation established between the two nervous systems, viz. Mesmeric relation―Attraction―Catalepsy―Community of sensation―Phreno-Mesmerism―Introvision, or perception of their own internal organism, and its probable changes―Perception of disease and its remedies in others―Of the influence of metallic substances, &c.―Experiments. 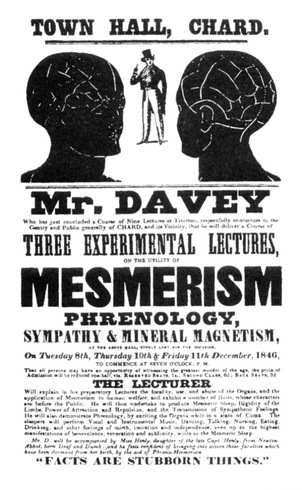 そのあとを書き写しておきます――"THE LECTURER Will explain in his preparatory Lectures the locality, use, and abuse of the Organs, and the application of Mesmerism to human welfare, and exhibit a number of Busts, whose characters are before the Public. He will then undertake to produce Mesmeric Sleep, Rigidity of the Limbs, Power of Attraction and Repulsion, and the Transmission of Sympathetic Feelings. He will also demonstrate Phrenology, by exciting the Organs while in a state of Coma 〔昏睡状態において「器官」を刺激することによって、骨相学のデモンストレーションをやる、と言っています〕. The sleepers will perform Vocal and Instrumental Music, Dancing, Talking, Nursing, Eating, Drinking, and other feelings of mirth, imitation and independence, even up to the highest manifestations of benevolence, veneration and sublimity, while in the Mesmeric Sleep 〔歌ったり楽器を弾いたり、踊ったり、喋ったり、飲食したりなどの行動、そして陽気 (mirth) とかマネッコ(imitation) とか善意 (benevolence) とか尊崇 (veneration) とか崇高 (sublimity) などの感情を、催眠状態の人が示す、というようなことが書かれているのですけれど、これは上にあるように「器官」、つまり頭の骨相学的な部位に触れることによって引き出されるわけです〕. 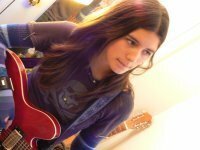 Mr. D. will be accompanied by Miss Henly, daughter of the late Capt. Henly, from Newton-Abbot, born Deaf and Dumb; and he feels confident of bringing into action those faculties which have been dormant from her birth, by the aid of Phreno-Mesmerism. LECTURE 1―Thursday, 15th. 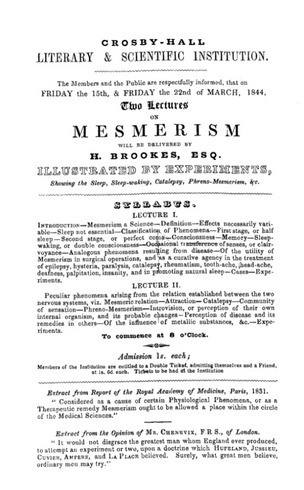 Mesmerism―its Philosophy, &c.―Rev. Lay Roy Sunderland's theory―Dr. Braid's theory―Division of the phenomena. First stage. Second stage. Third stage―Surgical operations performed during this stage. 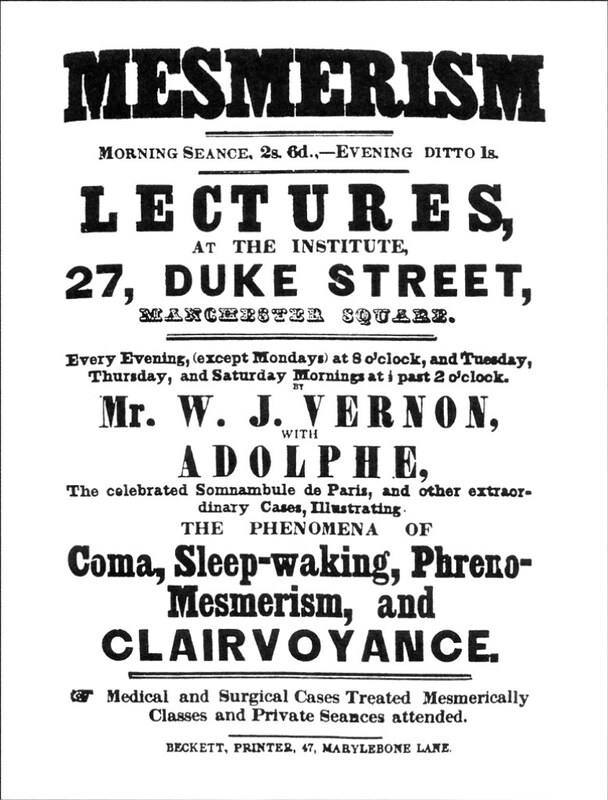 Mesmerism a curative agent in cases of nervous diseases, viz., hysteria, epilepsy, rheumatism, &c.
LECTURE 2―Friday, 16th. An explanation of the Physiology of the Brain and other leading principles of Phrenology; its harmony with Sacred Scriptures 〔聖書のことです〕. Phrenology useful in Education, and for success in certain Trades and Professions; Phrenology proved to be the best way of discovering how many talents and propensities each individual possesses. How to Train and Educate Children at half the expense, and in half the usual time. Doctor E. has also given hundreds of Analyses and Sketches of the Inhabitants of the Principal Towns, comprising the most respectable of both Clergy and Laymen, which had the effect of convincing all parties of the truth and importance of Phrenology, some of whom previously thought it a mere delusion. The Examinations have been of the greatest importance to many, enabling them to call into play, powers, with which they were not acquainted, and to check others which were a constant source of trouble to them 〔「問題の源泉となっていた力を抑制する」といっていますが、骨相学のチャートで「悪」の部分、すなわち、ガルは積極的に認めたけれど、シュプルツハイムは善性論から排除しようとした器官について、認めたうえで改善する、という姿勢です〕; they have likewise been equally important to parents, enabling them to quicken in their children those powers that are productive of knowledge and virtue, and to restrain those that have a tendency to evil 〔ここも同様に、「悪への傾向を示す力を抑止し」「知識と徳を生み出す力を促進する」という教育的効果です〕, and to make choice of those professions, trades, or other walks of life for which they are adapted. Testimonial of the REV. D. WELCH, D. D. Professor of Church History, in the University of Edinburgh, ** I have found great benefit from the science, as a Minister of the Gospel, *** in dealing with my people in the ordinary duties of my calling; the practical benefit I have derived from Phrenology is inestimable.